Export demand for cotton needs to improve for prices to rally while coffee futures were high last week. Wheat was higher last week as world prices held firm. Firm prices extend from Russia to Australia on reduced world production. It remains very dry in Australia, and yield and production estimates continue to drop well below those estimated by USDA. It is reported to be wet and cold in Siberia, but planting conditions are reported to be improved near the Black Sea. 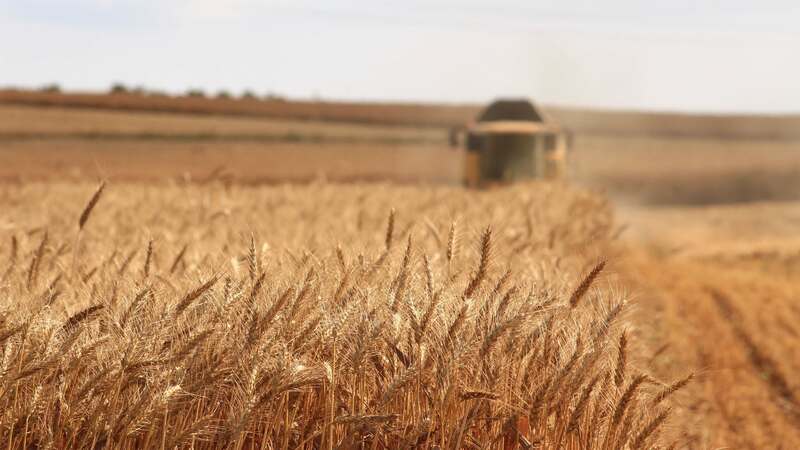 The Spring wheat harvest in Siberia has been delayed. Harvest has been difficult in parts of the Canadian Prairies due to snow and cold weather. Bullish traders think it is just a matter of time before world buyers turn to the U.S. as the other major exporters would be out of wheat for export, but for now, the buyers are looking everywhere they can for other origins and are trying to avoid U.S. wheat. The weather in the U.S. is improved for planting the next Winter wheat crop as much of the Great Plains has seen rains in the last couple of weeks and planting progress is slowing. More rain is possible later this week. Corn was higher on Friday and higher for the week. Chart patterns remain bullish and point to moves to about 378 December and then just under 400 December over time. The harvest continues to roll along with at least some work going on in almost all areas of the Midwest. Rain started to delay harvest progress late last week, and rains are expected early this week before drier weather returns. Harvest data as reported by producers still suggest that the crop can be another very big one. Harvest yield reports appear stronger in the eastern belt than to the west. Rainfall patterns have been very tropical this year, and have featured excessive rains in some areas and dry weather in others. Some yield reports are lower than averages and reflect losses due to the extreme weather. It has been a warm Summer as average temperatures have generally been a few degrees above long-term averages. The warm temperatures have kept plants active and have pushed maturity forward by up to two weeks or so. US Corn export sales remain very strong and were over 1.5 million tons last week. Soybeans were higher last week, and Soybean Meal was also higher. Futures are rallying as export demand has been much stronger than anticipated despite the trade war with China. The USDA export sales reports continued to show very good demand for US soybeans. The trade war with the Chinese continues, but other importers have been buying in the US in a big way as US prices are very cheap. They are cheaper than South American prices even with the 25 percent tariffs. Traders hope this trend continues, and traders also think that China will eventually need to find a way to buy US Soybeans at a reduced rate as they can’t buy enough in South America and other areas to cover their needs. There have been reports that Argentina, Brazil, and Canada are buying US Soybeans at the discounted US prices so they can sell their own Soybeans to the Chinese and reap some very big profits. Harvest results so far have generally been strong, and a big crop is expected in the US this year. Harvest has been interrupted in the last few days because of some big rains in the Midwest. These rains should continue for the first part of this week before somewhat drier weather returns. Farmers are actively planting in Brazil and overall planting progress is much ahead of normal. Rice was higher again on Friday on what appeared to be follow through fund short covering. The funds have held a massive short position and are now trying to buy out of that position, but they are finding little selling interest. Farmers think prices are too cheap and are still concentrating on harvesting in most areas. Futures rallied more than $1.00 per cwt. last week. The second crop harvest in Texas and Louisiana will be underway soon. Good to excellent yields have been reported in Texas and Louisiana so far, and good to very good yield reports are being heard in Mississippi and Arkansas. Cash prices are somewhat weaker as mills and elevators fill up. Milling yields have been acceptable to very good. Export demand has been good, and was especially strong last week as futures moved lower. Good export demand is expected to continue. World vegetable oils prices were mostly higher again last week. Palm oil was higher after making new lows for the move as export demand reports from private sources remained strong. Demand has been very active as Iran has been buying ahead of the new sanctions to be imposed by the U.S. and on improved demand from India before new taxes are imposed on imports. The market is anticipating strong production for the short term as the weather is good for the trees. However, both Malaysia and Indonesia are watching long-term trends as El Nino is expected to develop. Indonesian supplies are already less as demand from China has been strong. The weather could hurt production potential down the road. Soybean oil closed higher. The market is expecting better demand as world petroleum prices have moved higher. Support is also coming from less offer from South America and on higher Canola prices. Canola was higher on slow harvest progress amid wet and cold weather. Farmers have had a tough time getting into the fields due to rains, especially in the west. Yield reports are said to be below expectations and ideas are that StatsCan has overestimated production potential this year. Weekly chart patterns are bullish for Soybean Oil and Canola. Cotton was a little lower for the week as the weather was good for harvesting in just about all major crop areas. Some rains are possible in Texas and the rest of the Great Plains this week, but the rains should not cause any damage. The harvest might be a little slower in affected areas this week. US export demand has been poor for the last few weeks, and the lack of demand has hurt prices. Export demand needs to improve soon for prices to rally. The trade in India remains optimistic that a good crop is coming and that they will not need to import very much Cotton this year. China has been active in India buying and will buy as much as possible there to make up for production losses inside of China. Conditions have also improved in Pakistan as rains have been reported. Chart trends remain down, but nearby prices are getting close to target areas near 7500 on the weekly continuation charts. FCOJ was a little lower Friday in quiet trading and as the trade gets ready for the USDA crop reports on Thursday. No changes are expected to the old crop estimate, but the new crop estimate could show a sharp recovery in production if one is released. Good weather continues in Florida and as prospects for a much-improved crop from a year ago continue. Chart trends are down as futures stayed below some important resistance on the weekly charts. Overall growing conditions in Florida are good to very good, and there is no storm development in the Atlantic at this time. Florida producers are seeing good sized fruit, and work in groves maintenance is active. Irrigation is being used when needed, and producers expect a good crop. Futures were higher last week, and weekly charts show that futures had their best week of upside action since the summer of 2017 in New York. It was a very positive close in New York, and the long-awaited short covering rally has started. Futures are now at initial resistance near 110.00 December but have the potential to move through that area and closer to the 120.00 December area. Ideas of strong production in Brazil and Vietnam have been keeping futures under selling pressure. The Real has turned stronger before the elections in Brazil, and that might be helping to cause some speculative short covering. Higher US interest rates and inflation worries are causing buying in commodities in general. Vietnam is getting close to its next harvest, and ideas are that producers there need to sell more of the previous crop to create new storage space. Producers in both countries are not selling. New York closed higher and gapped higher on the weekly continuation charts. London was sharply higher as well. Both markets are showing that medium-term lows have been made on the weekly charts. New York is at some important resistance areas, so some back and fill is possible this week. Sugar was supported by reduced selling in Brazil due to the presidential elections that were held yesterday and ideas of increasing inflation in the US. Ideas of big world production are bearish and have been the reason for the selling. Just about everyone is looking for a significant production well above any demand potential. Dry conditions continue in Brazil, the EU, and Russia, but conditions are mostly good in Ukraine. Very good conditions are reported in Thailand and India. Brazil producers are worried about Cane production even with the rapid early harvest, and the market still talks about less production there this year. The dry weather in much of Europe and in southern Russia near the Black Sea has hurt Sugarbeets production potential in these areas. Recent rains in parts of Ukraine have continued to improve production prospects there. Futures closed higher on Friday, but lower for the week as the new main crop harvest comes to market in West Africa. Trends remain down on the daily and weekly charts. The outlook for strong production in the coming year has been enough to keep the prices weak, but there are some disease concerns for West Africa as a lot of humid air has promoted some concerns that Black Pod Disease could spread. The main crop harvest is in its earliest stages in some parts of West Africa. Main crop production ideas for Ivory Coast are high. Ghana and Nigeria are expecting very good crops this year as well. Ghana and Ivory Coast are hoping to set a joint minimum price in an effort to ensure at least some return for their producers as prices now are viewed as cheap. Conditions also appear good in East Africa and Asia. Demand is said to be improving as offers from the new harvest start to increase.